I remember a few years back browsing Julia Child’s book “The Way to Cook” noticing in the ingredient list of many recipes named the tarragon. I couldn’t recognize this word so I looked it over in the dictonary but it wasn’t of any help. I haven’t ever heard of “dragoncello” either in my young life. So I became even more curious and I started searching for tarragon everywhere. Nowhere to be found in any supermarket of my -small- city. One day running some errands into the historic center of Siena, I passed by a local greengrocer which had a blackboard outside the door stating “Fresh wild tarragon!”. I stopped in the middle of the road and I couldn’t believe it.. I found it!! Anyway, herbs and spices are one of my biggest passion and I always try to find a way to use them differently. When I bought the fresh tarragon – despite all the Julia Child’s recipes – I didn’t know exactly what to do with it. So it came up the idea to add it to the gnocchi dough as a twist! Useless to say, it quicky became one of my favorite gnocchi recipes. 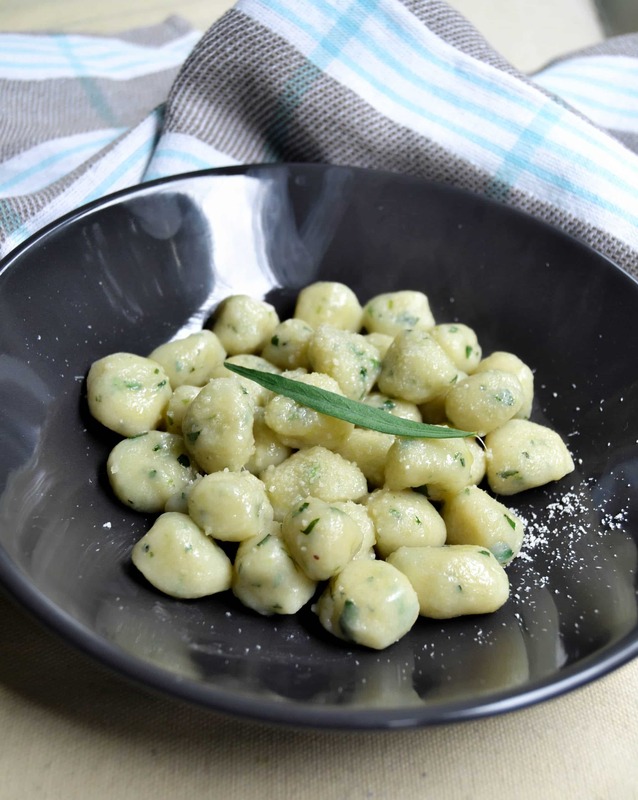 If you never tried (fresh) gnocchi before, you MUST try this recipe! 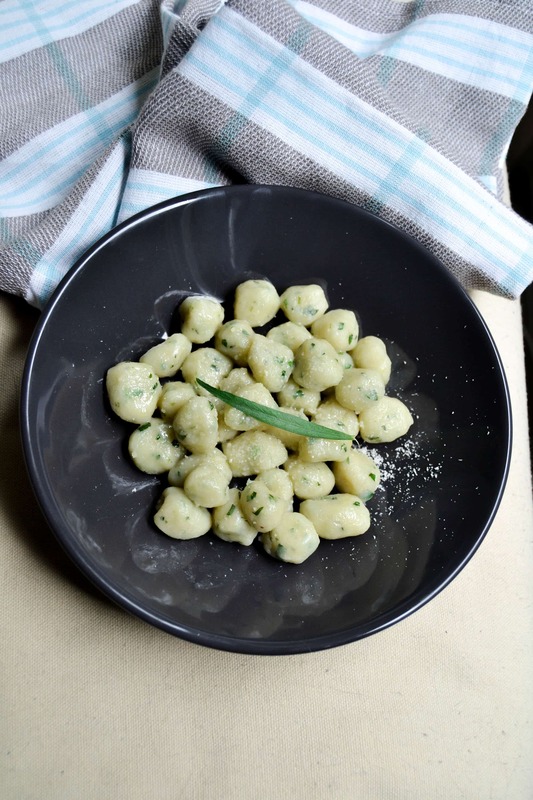 (you can omit the tarragon and have the simple basic potato gnocchi). Gnocchi are delicious fluffy little balls made of mashed potatoes and flour, usually eaten with only melted butter and fresh sage. Don’t follow the measurements to the letter, the quantity of flour really depends on the type of potato you are using. I suggest to add the flour slowly until you reach the right consistency of the dough. Peel, cut in small cubes and boil the potatoes until they become really soft (about 20 minutes). Then mash the potatoes evenly and add the finely chopped tarragon leaves and the flour when they are still warm (overwise they'll become sticky). Mix well until you get a nice non-sticky dough. When you have an even dough similar in consistency to the bread dough, cut it in smaller parts and roll them with your palms to get a long snake thick 2 cm of diameter. (keep the surface and the dough smooth with flour to prevent stickiness). Now with a dough-cutter cut the gnocchi about 2-3 cm long. (You can then roll them on a fork to get the typical gnocchi lines). Let them rest separated. In a large pot bring to boil salted water and toss the gnocchi one by one so they won't stick. It will take 1-2 minutes to cook. As soon as the gnocchi float to the surface, it means they are ready to go! Take them out with a skimmer and toss them in the pan with the melted butter. Plate the gnocchi and on top add the grated ricotta salata and ground black pepper to garnish.